I enjoy doing landscapes. You will see a few of my landscapes seascapes for sale on this page. 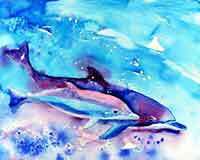 Original paintings and reproductions are available. 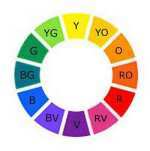 I enjoy painting with oils or watercolors. 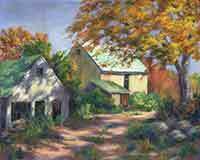 "Country Barns" won me a best of show award. 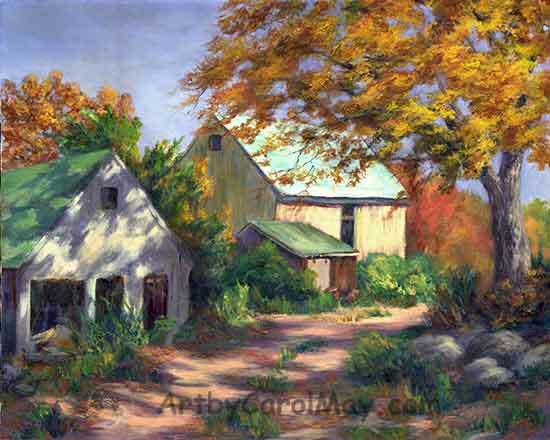 I did “Country Barns” on a trip to New England the first time I had seen New England fall colors. I was especially intrigued by the shadows and sunlight on the front barn. The barns are different styles as happens when they are built years apart. 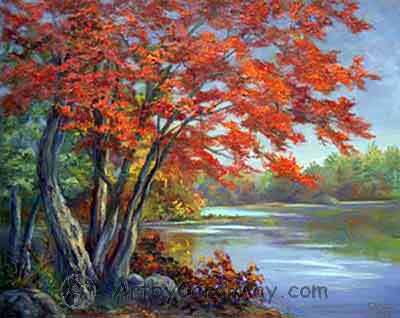 My painting roots are in landscape paintings. I now paint everything from flowers to mountains. I especially enjoy doing all the critters in nature. View these landscape paintings thru my artist eyes. Sit back and enjoy just like you were there! 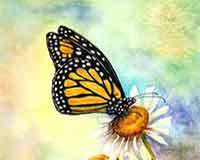 You may see a close up and detail views of the paintings on Fine Art America. I had the privilege of living in Florida for more than thirty years. The sky there is beautiful. And there are lots of Cypress trees. 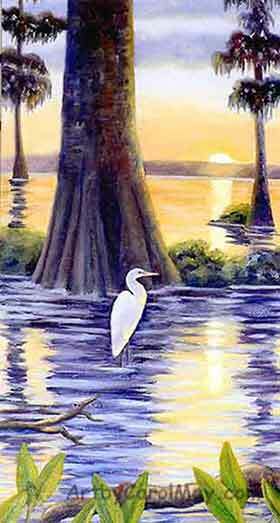 Here is a "Cypress Sunset" with a white egret in the shadow of the tree. On the gulf coast of Florida you may see stilt houses out in the bay. Most of these homes were built years ago. Many were used by the commercial fishermen. It was a life very close to nature. Most of these houses have decimated now by the hurricanes. But I was fortunate to get a photo of this one in Cedar Key called the "Honeymoon Cottage". It was in its sunset years, so I painted it in a sunset. I was born high in the Sierra Nevada Mountains in California. 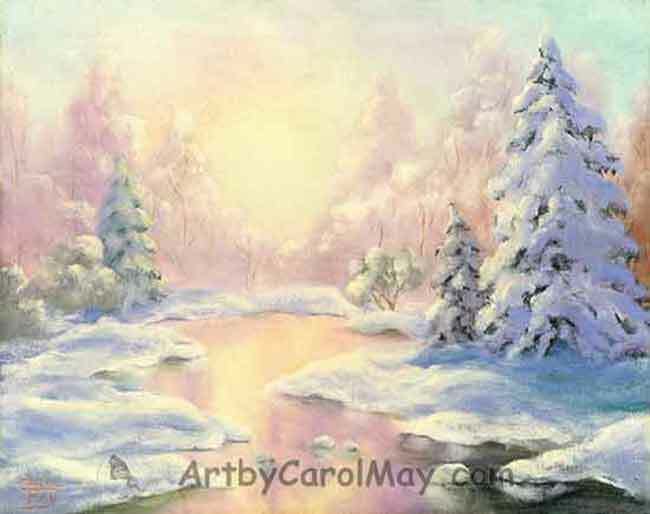 So, I wanted to paint this "Winter Wonderland" of where I am from originally. I saw this beautiful "Swamp Maple" tree in the New England area one fall. It was on the edge of a mill pond. It was so pretty and cried out to be painted. The middle of Florida has a prairie area with Sabal Palms and numerous lakes. It's common to see Egrets and other birds fly by on their way to go catch some frogs or fish. It's a lovely area often missed by the tourists. 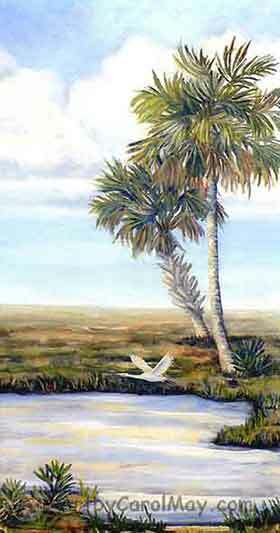 I painted the "Lone Egret" flying across the prairie. The gallery owner where I had landscapes seascapes for sale asked me, "Where is this lighthouse?" 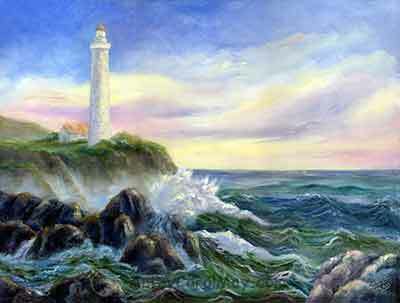 I told her God gave me the idea, so I called the painting, "God's Lighthouse". Jesus is our lighthouse in any and all situations. We can always find our security in Him. 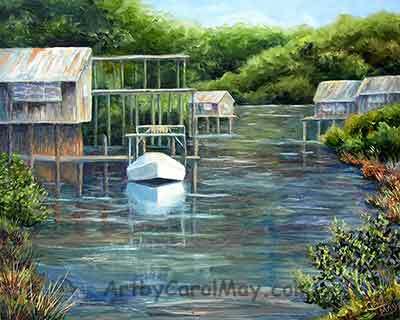 These stilt houses are on a "Cedar Key Canal". On the Florida gulf coast many of the stilt homes are built on the canals to get protection from the storms. 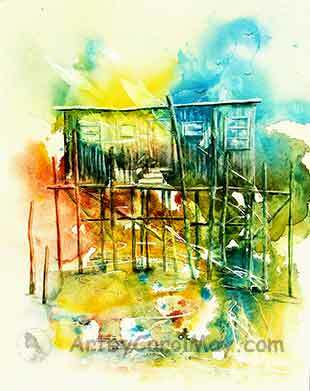 We lived in a stilt house at one time and docked our boat under the house. I love the ocean and the mountains. I can't help but to do some painting. Can't you hear the surf crashing as the Sandpipers are running to beat the waves? Learn How to Paint a Wave in five easy steps. 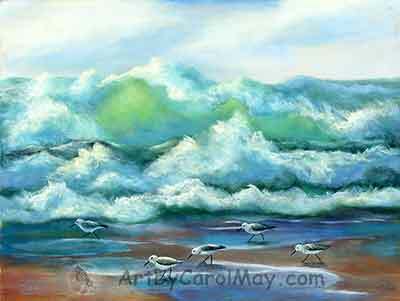 I enjoyed showing these landscapes seascapes for sale. I hope you enjoy them. They bring a peace into the home.